Actors Gerard Butler and 50 Cent discuss their upcoming crime thriller. The most captivating action films not only feature stunning stunt sequences, but are also reflective of contemporary society. These unique stories show how people of all backgrounds are complex, and the lines between good and evil aren’t clearly delineated. One such story that upholds the contemplation over how the perceptions of right and wrong aren’t always clearly defined as people navigate life’s challenges is the one that’s told in the new drama, Den of Thieves. The action movie marks the feature film directorial and producing debut of Christian Gudegast. 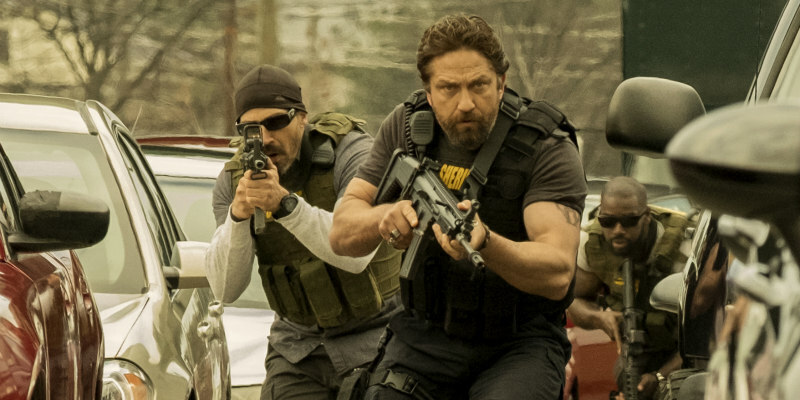 The filmmaker also wrote the script for Den of Thieves, which stars Gerard Butler and 50 Cent, whose characters are working on opposite sides of the law. Butler, who plays one of the detectives, and 50 Cent, who portrays one of the bank robbers, generously took the time recently to sit down for a roundtable interview at The Whitby Hotel in New York City, to discuss starring in the action crime drama. The script for Den of Thieves has been circulating for some time now, as Christian was first inspired to write the story in 2002. When did you both receive the script, and how did you become attached to play your respective roles? 50 Cent: Well, I read the script for the first time six years ago. I met Christian at that time, and he already had an idea of what he wanted the film to look like. So he had a look book and shot locations. Remember the movie, Smokin’ Aces, and the bright colours it has? Well, that was the initial look and feel that Christian wanted for our film. So I wanted to be a part of a project like that. When the script for this movie came to me, it was unpredictable. I can appreciate heist films, particularly the action, which excites me. There was also more to the characters than just the action. But with many other films in this genre, the stories are just about the heist. In the relationship between (Pablo Schreiber’s character,) Merrimen (who’s the leader of the robbery gang,) and (50 Cent’s character,) Levi, there was unspoken emotions between them; they knew what was going on with the other without them having to say anything. Gerard Butler: I read the script way back then, as well. I’m good friends with Christian, and we’ve worked on a few projects together - there were a few that he had written and given to me, and there were also a couple that I had him write. But the problem after that was that it took awhile for the movie to get made. It was set up at a company that wasn’t doing particularly well. The moment they got out of the picture, we were ready to make the movie with another company, and tell this incredible story. Gerard, you mentioned that you were nervous about meeting with Christian to talk about the script, but audiences have seen you in other action films. Why were you nervous? Was it because the character was hard to read? Gerard Butler: No, it was just complete immaturity on my part! (Laughs) The second I like something, I get nervous. It’s human nature! I just really wanted to do it, so the negative part of my head started thinking that Christian had already found something else for the role. But what it turned out to be was that it took us six years to get the film made. When you talk about making a movie, it doesn’t mean that you’re trying to make it every day; it comes back around every few months. So Christian and I had so many dinners where we would sit and talk about this movie, and what “Big” Nick meant. At one point, Tucker (Tooley), who’s one of our producers, said “You and Christian have talked this movie to death.” I then told him, “I don’t remember what we said! It’s been six years of these discussions!” But sure enough, I did remember. Christian’s such a good director, and he explains things so well, because he understands them. That’s why the script is so great, because he explains things so well, and you feel as though you’re there. One time, he was explaining one part of the story so well that I became distracted. We were sitting in Benihana and talking about “Big” Nick. Christian said to me, “You see the way you’re holding that glass? That’s the way “Big” Nick would hold it.” The more we were talking about the story, the more I was getting into character. I then started eating what I thought was raw fish, and I ate the whole plate. I started thinking, this is quite chewy for raw fish. But I kept eating it for about 40 minutes. When I got to my second plate, he said, “What are you doing? That’s chicken.” I had eaten two plates of raw chicken, which was supposed to be cooked at the table. When the chef came to start cooking it, he was like, “Where’s the chicken?” I had eaten it all, being “Big” Nick! How do you both like to be prompted in your scenes by the director once you begin filming? 50 Cent: I like for them to know what they’re asking me to do! Sometimes, the director will give the actors notes, but they won’t be as informative or clear as we’d like. If they’d like you to make an adjustment, that’s fine. But I like them to know exactly what kind of adjustment they’d like. The guys on this film got into their roles so well, even the physical aspects, because we trained for two weeks before we began shooting. We worked on the physicalities and movements so much that everything was down pat by the time we got to the set. There were points where I wasn’t working, but the rest of the guys were performing. So I had the chance to watch the rest of the movie, instead of be in it. I appear to be a workaholic, but I’m enjoying myself. Gerard Butler: What was amazing was that every single person who was cast in this film is the ultimate alpha male. (Laughs) If you look at this man here (gestures to 50 Cent), me, Pablo and O’Shea (Jackson Jr., who plays the robbers’ driver, Donnie), you see that we’re all big guys who have a lot of their own things to say. Yet, you couldn’t find men who bonded more than on this movie. Everyone had a great time together, and treated each other with a lot of respect. Then you also had Christian, who, even though this was the first time that he directed a movie, was a master at what he did. He was so encouraging. What I love about him is that he loved to see people experiment. He encouraged us to try anything we did that was different. I was actually the boring one, in a way. I was like, we already have a long and phenomenal script, so let’s not have people experiment too much, and get too far away from what worked well on the page. But I love that he had the confidence to encourage us to try new things. 50 Cent: A lot of times, writer-directors, especially on their first projects, fall in love with their words. For six years, we kept going over the script for this movie. With films in general, the filmmakers rewrite the story over and over again, until they feel it’s perfect. Then once the performers start working on the project, the filmmakers can make even more adjustments. That’s what Christian did really well - he watched and listened to the actors, and then gave direction at different points. How did you both approach the process of making your characters more likeable? 50 Cent: I think that was something that was really important to this story. How the characters are developed helps in the way that viewers perceive those characters. If the audience doesn’t see the characters like something, it’s easier for the viewers to see the characters as monsters. Once the characters begin to open up and have meaningful relationships, people may start to think, I really do like them now. People don’t always accept a character who they don’t relate to. Gerard Butler: I think that many of the most memorable characters are the ones who are messed up, and are venomous and bullies. But you can’t take those characteristics too far when you present the characters to the audience, because you can then lose the audience. That was the danger to my character, especially when it came to unfaithfulness, and then returning home with kids in the house. So it took a bit of balancing to show both sides of “Big” Nick, because he’s the protagonist. You want the audience to be on his side. But you also have to give a truthful assertation of who this guy is. At the end of the day, he’s a cop who’s trying to bring down the bad guys. But that involves some lowlife activity. So he’s made the decision that if he’s going to beat the worst, he had to be worse than them. That took a toll on his life. But you realise that a lot of the time, Nick’s just playing a bad guy, and at the end of the day, he’s really just a big kid. Nick’s not the classic definition of what it is to be a man of his word. He’s a terrible father; he loves his kids, but he doesn’t know how to be a dad. He’s also a terrible husband. However, he’s incredibly courageous, and he’s good at his job. He’s also loyal amongst his friends. But other than that, he’s full of fear. He’s such a damaged human being. 50 Cent: That’s why I spent a lot of time watching your performance, Gerard. I wanted to see if my interpretation of your character matched up with the choices you made as an actor on the set. There’s a point where law enforcement becomes criminal, in order to combat criminal behavior. The police have to understand, and identify with, the criminals’ lifestyle, and what they would do. You showed that through your portrayal of “Big” Nick. 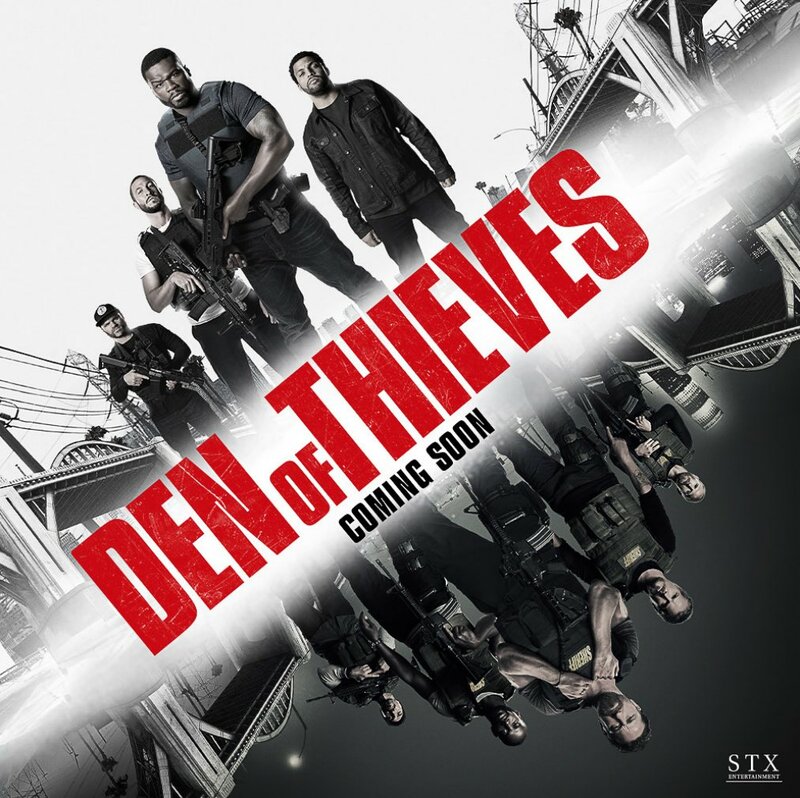 Den of Thieves is in UK cinemas February 2nd.